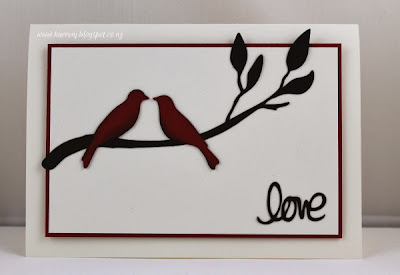 Coming up is a reasonably quick card I made for both the inspiration photo challenge at Hand Stamped Sentiments and the Die Cut challenge at Addicted to CAS. 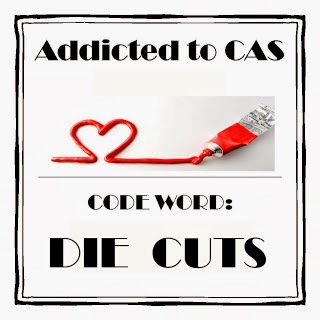 I hope this passes at Addicted to CAS because it's not strictly die cuts, but rather cut files using my Silhouette Cameo. I cut the file in both Early Espresso and Raspberry Ripple then cut out the birds in Raspberry Ripple and adhered them over the top of the Early Espresso die cut. I sponged all the pieces to give a bit more dimension. The sentiment is another cut file. The card base is Very Vanilla and the main image panel is popped up on dimensionals. I couldn't lighten the photo without losing definition so apologies for the darkness. Karren, what a great card. 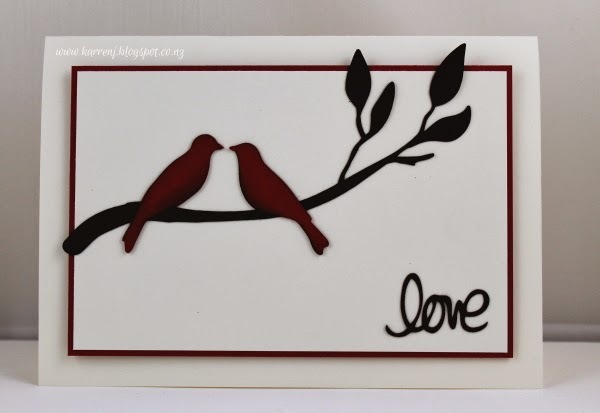 I love how you added dimension to the birds and the branch and the sentiment is perfect with the birds. 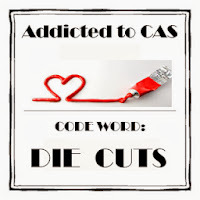 A perfect CAS creation Karren - (and a perfect Valentine card too)!! Love it! Those Silhouettes are really something! Love this! Perfect Valentine! 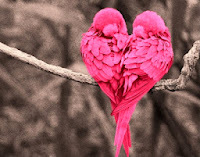 hi Karren and thanks for sharing this wonderful card with us at ATCAS such a beauty. I used my Cameo to make my DT cards so I would say you are safe lol ! I'm loving the layout and the clean lines. Such a pretty card! Thanks for joining us at HSS!